Look what the postman brought me today, ok the postman didn't exactly get his yarn and hook out and make this for me, he just delivered it! 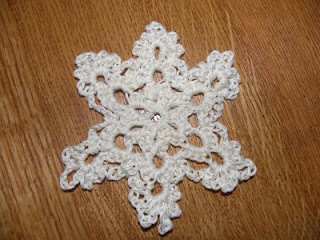 Mum was the super-duper clever one who made this lovely snowflake. Having read my blog my Mum has decided to get a little crafty again and conjured up this little cutey. Looks really impressive and it will certainly be pride of place on my Christmas tree. The snowflake looks good especially with the wood background. It will look even better with the dark green of a Christmas tree.